Wow! This was a stunningly advanced computer for the time. I think it would give HAL a run for his money. 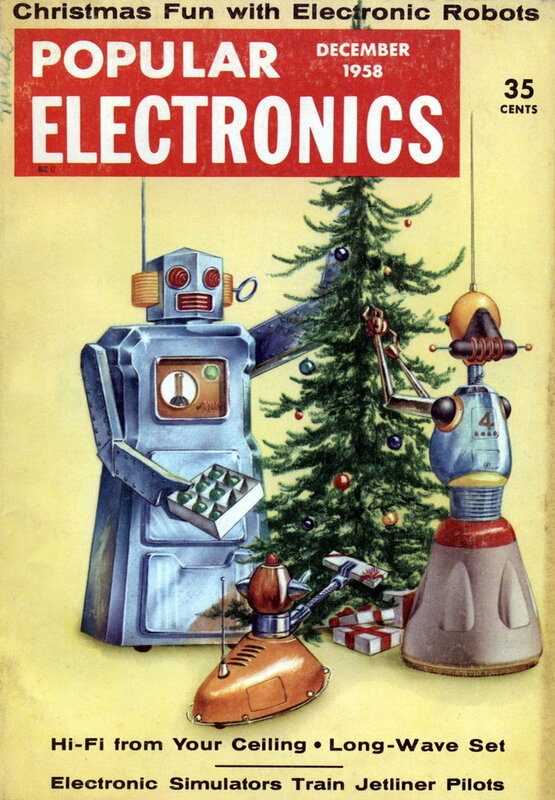 By Hugh B. Brous, JR.
FIRST OFF, let me tell you that the MRS is no off-the-shelf commercial computer. MRS stands for Multipurpose Research System, and we designed and built the whole works ourselves at the Research Institute. Consequently, we can blame only ourselves for the design features that led to all the troubles. Everyone on the staff still feels that the basic concepts are sound but we unanimously agree that some changes will have to be made before MRS can be a dependable computer system. 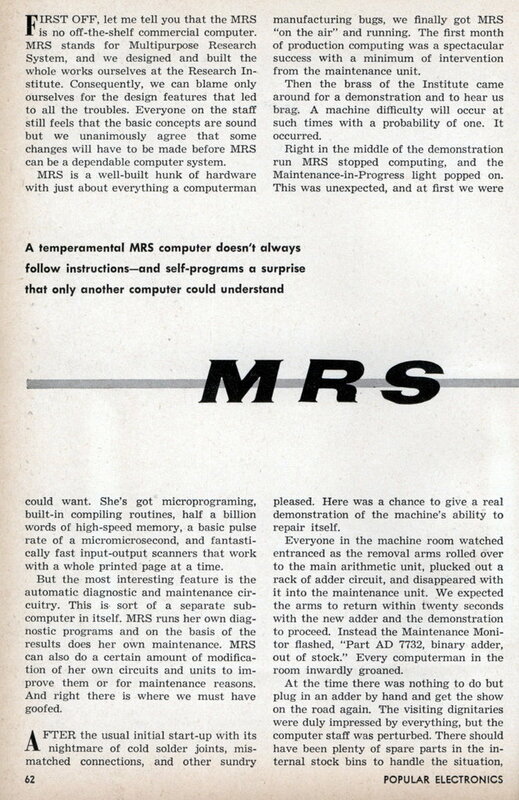 MRS is a well-built hunk of hardware with just about everything a computerman could want. She’s got microprograming, built-in compiling routines, half a billion words of high-speed memory, a basic pulse rate of a micromicrosecond, and fantastically fast input-output scanners that work with a whole printed page at a time. But the most interesting feature is the automatic diagnostic and maintenance circuitry. This is sort of a separate sub-computer in itself. MRS runs her own diagnostic programs and on the basis of the results does her own maintenance. MRS can also do a certain amount of modification of her own circuits and units to improve them or for maintenance reasons. And right there is where we must have goofed. AFTER the usual initial start-up with its nightmare of cold solder joints, mismatched connections, and other sundry manufacturing bugs, we finally got MRS “on the air” and running. The first month of production computing was a spectacular success with a minimum of intervention from the maintenance unit. Then the brass of the Institute came around for a demonstration and to hear us brag. A machine difficulty will occur at such times with a probability of one. It occurred. Right in the middle of the demonstration run MRS stopped computing, and the Maintenance-in-Progress light popped on. This was unexpected, and at first we were pleased. Here was a chance to give a real demonstration of the machine’s ability to repair itself. Everyone in the machine room watched entranced as the removal arms rolled over to the main arithmetic unit, plucked out a rack of adder circuit, and disappeared with it into the maintenance unit. We expected the arms to return within twenty seconds with the new adder and the demonstration to proceed. Instead the Maintenance Monitor flashed, “Part AD 7732, binary adder, out of stock.” Every computerman in the room inwardly groaned. At the time there was nothing to do but plug in an adder by hand and get the show on the road again. The visiting dignitaries were duly impressed by everything, but the computer staff was perturbed. There should have been plenty of spare parts in the internal stock bins to handle the situation, but later, when we looked in the bins, some of the parts were missing. AND THAT was just the beginning. For the next several months MRS played this game with us. Parts, both good and bad, disappeared into the innards of MRS, and try as we might, we could find no clues as to what was happening to them. MRS was doing some obscure hardware work internally which we didn’t understand. Since this idiosyncrasy caused no large amounts of delays in the computing schedule, the Chief Computerman refused to let us shut down MRS to investigate. About a month after this cannibalism began, we ran up against a second class of difficulties. MRS refused to accept data for certain types of problems. We would feed the data sheets into the scanners, fire up the program in the usual manner, and almost immediately we would get output. This output consisted of nothing but the input data, unprocessed. No amount of checking of both the data and the machine itself could find the cause of this cute trick. But just when the Chief was ready to say shut her down, the difficulty went away. This bug was replaced in a few days with a new one. The warm-up time in the morning, instead of lasting the usual twenty minutes, started stretching out to an hour or longer. There were days when we waited until almost noon for a ready light. During much of this dilly-dallying around, the Maintenance-in-Progress light was shining brightly. And there were mornings when MRS acted just plain sluggish. We would watch the voltage monitors, and those meters would take just too much time to get up to the proper levels. We checked the power coming into the machine room, and it was okay. This bug also defied discovery. MRS was just going to take her own sweet time about getting ready to work. THINGS were fast coming to a head. We were running MRS three shifts now just to get the work out. Dozens of times a day the maintenance light would turn on, and the removal arms would go wandering around the room somewhere. Almost continuously we could hear the built-in drills or grinders or something working away inside the maintenance unit. And in spite of a hundred tons of air conditioning, there was always the smell of burnt solder flux in the machine room. Finally the Chief threw in the towel. He gave the order to shut down MRS for a while and for us to dig in and modify the automatic maintenance. Maybe with part of this operation on a manual basis and dependent upon human decisions, we would be able to get more good time from the computer. However, we had one important job to do before the shut-down, and I drew the duty to sit with MRS on this last run. If the machine had run according to design specs, this job would have been done by around midnight. But of course MRS didn’t run exactly according to our expectations, and I spent the night in the machine room. More than half the time I sat looking at a glowing maintenance light and wondering what was going on. JUST a little before daylight, MRS quit computing completely and dumped out the output to date and reams of unprocessed data. Then maintenance lights flashed on all over the room. I figured MRS had had it and dashed around to the rear of the maintenance unit to pull the covers and see what MRS was up to. The removal arms got there first and dropped the covers right in my path. I skidded to a halt to keep from getting hit. Then the arms pulled out a collection of miscellaneous boxes of hardware that I had never seen before. Then they produced a collection of cables and plugged all these boxes together, and darned if the whole array didn’t look like a scaled-down version of MRS. About that time the output printer began to clack away. The big question around the Institute now is, if MRS is the mother, then who is the father? Unfortuntly this is a spoof article! maybe they held it over from April. I got a kick out of the “author’s” name. Some boastful claims indeed from Mr Hubris!